Maureen Brass was a teacher evacuated to Kettering at the beginning of the Second World War with St. Dominics Infant School. We are grateful to her for an account of life experienced as an adult evacuee attached to our parish and for photographs she has been able to supply from St. Dominic’s School archives. This is a transcript of her oral account from 2009. My name is Miss Maureen Brass; I am the retired head teacher of St. Dominic’s Infant School in North West London. The school is on the boundary of Hampstead and Kentish Town. I’m 93 years of age, almost 94. I retired in 1980. When war broke out I was still living at home in Esher in Surrey. 1938 was an uneasy year for everyone and preparations had to be made for the safety of children should war break out. Accordingly it was decided that if their parents wished, children should be moved out of the big cities to less vulnerable areas and local authorities made preparations for evacuation should the need arise. The London County Council, known as the LCC, used the existing schools organisation. Gas masks were distributed to schools and we practised gas mask drill. Windows were measured for large blackout curtains. All the teachers had to attend a first aid course on one evening a week for six weeks at the end of the Spring term. This was a practical course, a very useful course, and certificates were awarded in the six weeks. I still have mine and it is in the school archives. So we got through 1938. In the last week of the summer holidays in 1939 all teaching staff were recalled to the schools. Many teachers were still on holiday on the Continent. Hundreds, so it seemed, left France very early the next morning. It was standing room only on the boats crossing the Channel. The week was spent in school registering children for evacuation. Parents would register their older children to go with their younger children with the Infants staff. Others registered their little ones to go with their older children with the Junior and Senior staff. We checked gas masks, gave parents lists of what the children should bring with them, made labels showing their names, the name of the school and the school number. Our school number was 0302. Staff wore white armbands, showing the school number in red, we made our own. Each school was allocated an extra teacher and a volunteer helper. St. Dominic’s Infants group was Mrs Monaghan the head teacher, myself, Miss Noreen Beard, Miss Katie Geoghan, and Maurice Calnan, a newly qualified teacher from the junior staff as our extra member. Miss Sheelah Hynes was to be our helper, she was invaluable. So on the morning of September 1st 1939, all the children assembled in school around 7.00am. The staff had arrived at 6.00am. We checked our groups for labels, gas masks, extra clothing etc. and at 8.00am we set out from the school, waved off by tearful mothers, grandmothers and others. The groups, Seniors, Juniors and Infants, with staff and helpers walked in fours to Kentish Town West Station. I didn’t know until that morning that there was a Kentish Town West Station! We all boarded a train that was waiting for us and set out into the unknown. At Mill Hill Station the train stopped and we all got out. There waiting across the platform was our next train. We boarded this train, still not knowing our destination. The train stopped at Luton and the Senior and Junior groups got out, they had been in the back part of the train. As the train moved off again Miss Hynes told us that the porter had told her that we were going to Kettering. Mrs Monaghan and I looked at each other and both said “boots and shoes”, the sum total of our knowledge of Kettering. On the platform at Kettering Station officials sorted out the groups and took us to the Grammar School. Their billeting officers started taking the children off to billet them on local residents. My group was taken to an area near St. Mary’s Road. Finally at half past five I went to find Mrs Monaghan and the other members of staff, they were back in the Grammar School with many others still not given somewhere to stay. I was hungry, very hungry. Breakfast had been before 5.00am. The reason it had taken such a long time to billet my group was because people who had offered to take one child found that brothers and sisters would not be separated. Also they were reluctant to take the little girl with her broken arm in a sling or the little boy with his leg in plaster. When I finally returned to the Grammar School tired and hungry and no billet, Mrs Monaghan greeted me with a cup of coffee and to everyone’s amazement opened a flask of brandy and poured me out a measure. So we arrived in Kettering on September 1st 1939. We had arranged to meet the next morning, September 2nd, by the church and I arrived there at 9.00am with Miss Beard to find Mrs Monaghan already there with a number of our children sitting on the pavement outside the Presbytery clutching their belongings, while a billeting officer tried to rebillet them. After just one night the children had been turned out of their billets in a select area of the town. Taps and running water had been their downfall. They had been fascinated by bathrooms and taps and running water inside the houses and left the taps turned on. Not all our children were used to such luxury; many families back in Kentish Town lived in two or three rooms with one tap between two or three families and no bathrooms. As we were trying to rebillet the children a young lady came into The Grove from London Road and announced “I’ve come to help”. It was Agnes Langley. 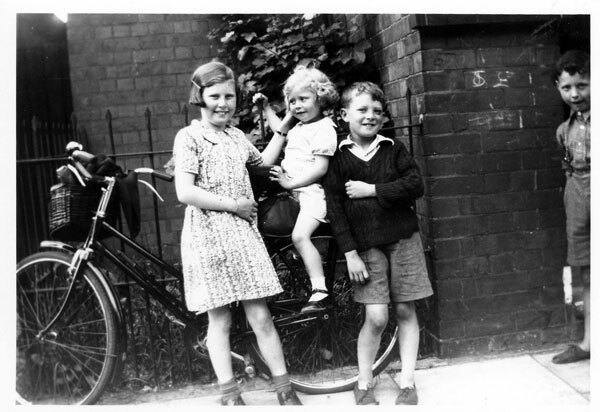 This was the beginning of a lifelong friendship between the Langley family, Mrs Monaghan and me and many other evacuees. During the time we were in Kettering (I was there for 4 years); we were always welcome at 91 London Road. Some of us have been back to Kettering very many times to stay with Mr and Mrs Langley and the family and latterly with Agnes in 113 Greenhill Road. Langley bungalow, 150 London Road. Mariam Monaghan, Fr. 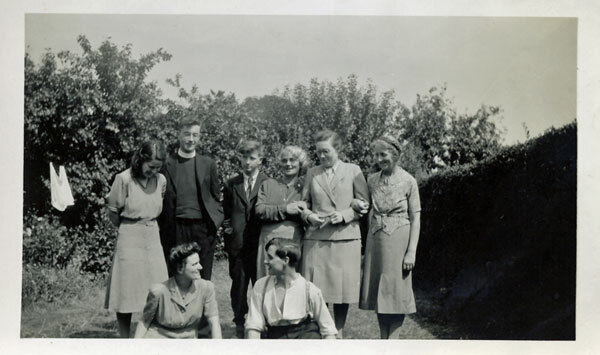 Clarke, John Langley, Mrs Gertrude Langley, Maureen Brass, Cecilia Coney, Cecily Coney, Fr. Gerard Langley. Each year, after the war ended, Mr and Mrs Langley would invite some of the one-time evacuees to spend the weekend with them for their New Year’s party. We loved those weekends, such a welcome, such fun. How we all fitted into number 91 and later into their bungalow after they had moved further down London Road was a miracle of organisation. I and many others look back with great affection to Mr and Mrs Langley and their family. Mrs Monaghan, on arrival in Kettering, introduced herself to the Parish Priest, Fr. Hunting, later to become Canon Hunting. He gave us the 9.15 Mass on Sundays, 3 o’clock Benediction every Sunday afternoon and the 11.00 Mass on Holydays of Obligation. He made us feel very welcome. So on Sunday September 3rd, the staff, and as many children as we had been able to notify, came to the church for the 9.15 Mass. Fr. Macklin said the Mass and during Mass we sang 4 hymns of our choice. One of our senior boys pumped the organ while I played. The organ was on the left side of the church, about two-thirds of the way back from the front. It was a two manual organ with pipes, stops and pedals and our senior boys took turns to pump it each Sunday for our services. We called it pumping the organ but I think we should say they took turns at blowing the organ. On that first Sunday, we heard on the radio at 11.00 that war had been declared, however we returned for Benediction at 3 o’clock. Children who were billeted outside the town towards the Rothwell area could not come to the 9.15 Mass as there were no buses on a Sunday morning in 1939, so Miss Hynes and I decided to bring them to Benediction. The older ones walked and we wheeled the little ones on our bicycles, one on the seat, another on the cushion on the carrier at the back. So began our life as Parishioners of St. Edward’s in Kettering. Father Macklin moved shortly after we arrived and Fr. Jones became the new curate. We were made very welcome in the Parish as were two other London Catholic schools who had arrived in the town on September 2nd. St. Aloysius Convent Grammar School from the Euston area of North West London arrived with full staff, religious and lay. The sisters were the Order of Faithful Companions of Jesus, known as FCJs. The other school was a Convent School from Hampstead in North West London with religious and lay staff. The sisters were from the Order known as Sisters of Providence. The sisters from this school returned to London early in 1940 and we took over their pupils. St. Aloysius Grammar School was to share the premises of Kettering Grammar Girls School in Rockingham Road, but until the education officer found accommodation for us we were first given a very large room in the basement, so it seemed to us, of St. Mary’s school. We were too crowded to do any teaching, but as the weather that September was very good we spent several days in the football stands in the recreation ground at the end of the Headlands, trying to teach Seniors, Juniors and Infants. Not very easy. Finally the infants were given a room divided by screens in St. Mary’s School and the Juniors and Seniors shared Hawthorn Road School. Mrs Monaghan and I, together with a Miss Honoria Murphy were in Hawthorn Road School, also Miss Kate O’Connell, who had been sent to us to teach the seniors in place of Maurice Calnan who had rejoined his colleagues in Luton as he was soon to be called up. After the new church was in use, the old church became the Parish hall and the Seniors, with Miss O’Connell, moved out from Hawthorn Road School and were given accommodation in the Parish hall. The organ in the church hall had been dismantled, by Mr. Cunningham I think; he was one of the church organists. The organ was either put into store or sold or given to another parish. With St. Dominic’s groups so divided in the town Mrs Monaghan needed transport to visit them regularly. Miss Hynes and I already cycled but Mrs Monaghan was not a cyclist, however she bought a bicycle in Halfords and soon learnt to ride it. The model she bought was a Hercules and it cost 3 pounds 16 shillings, almost a week’s salary in those days. Miss Hynes visited every child’s billet regularly and kept an eye on the children’s clothing and footwear. She came into the school every morning at 9.45 and discussed any points arising with Mrs Monaghan. While she was in the building the children could come out and talk to her should they have any worries or health problems. I must mention Dr. Emmanuel, he was so good to our children. We could take a child to him if necessary at any time. He was always available for us should a child need to see a doctor in school time. 1940 saw the opening of the new St. Edward’s church in London Road. Fr. Hunting was very anxious to use the church as soon as possible and I remember that Sunday afternoon very well. The church was packed; boys and men were allowed onto the sanctuary to free seats in the church. The floor was not quite finished in some of the rows. The event is well recorded in the church archives in which latterly Agnes Langley so regularly recorded parish events. The new organ was a Hammond. It was an electric organ, with two manuals, pedals and stops but no pipes. The organ was in the loft overlooking the sanctuary but the works were valves placed behind and underneath the altar in the church. Fr. Hunting was always pleased to show people where the works were placed and he allowed me to practice on the organ whenever I wanted to. After we had been in Kettering for about 3 years, Mrs Monaghan was recalled to London and our numbers were getting smaller as children were drifting back. I used to have the smaller number up with me in the organ loft during Mass and Benediction and they could look down on the priest, usually Fr. Jones, as he was saying Mass, and so learnt more about the Mass. They liked singing from up above and usually during Mass, although we did vary the hymns, they sang Panis Angelicus after the consecration. Not bad for a mixed age group of London evacuees. We had a little girl with the making of a good voice and a boy with an exceptionally good treble, another little boy had a very good voice. The three of them were not a bit shy and all the children sang quite well. Our school manager in London (school managers are called governors these days) was Fr. 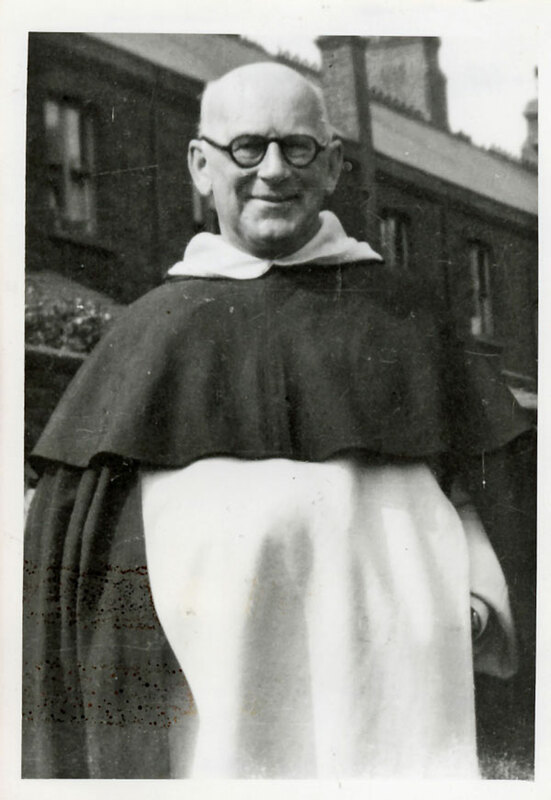 Bertrand Pike, a Dominican priest. The school in London is in the parish of Our Lady of the Rosary and St. Dominic. 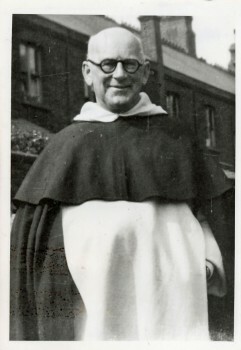 Before he retired in 1937 or 1938, Fr. Pike had been headmaster of the Dominican Public School for Boys at Laxton, and from time to time during the war he would come to Laxton for a rest from the air raids in London. On these occasions he always visited us. These visits were never planned, he would suddenly be seen walking through the town to find us as we were moved around several times and finally ended up in the Tordoff Hall. The Tordoff Hall was a far cry from our lovely new school which we had left behind in London. Fr. Pike realised that we needed a manager on the spot because the staff in the education office in Kettering were not used to having a Catholic school in the town and we did need the support of the Catholic authorities. So Fr. Pike handed over his responsibilities to Fr. Kevin Jones. From then on Fr. Jones was available to support us with school problems as they arose as well as looking after our spiritual needs. We remembered him, and I still do remember him, with gratitude. L-R. Back Row: Eileen Gay, Frances Bédat, Irene Goreham. Middle Row: Doreen Walsh, Ann Winter, Michaelina Allocca, Imelda Bartolo. Front Row: Joyce Gay, Betty Bédat, Johnnie Goreham. After Mrs Monaghan returned to London, life became very difficult in the Tordoff Hall. I found the piano locked and the windows fixed so that we could not open them. The summer was very hot that year and the place got very hot and stuffy. However we got by, the children continued to do good work, with three of them winning scholarships to grammar schools. I bought an autoharp, and in those days I could sing so we continued with our music. Mrs Langley allowed the two boys who were learning the piano to have their lessons in 91 London Road. We were always welcome there but I never felt we were welcome in the Tordoff Hall. About the actual building of the new St. Edward’s church in London Road. Fr. Hunting was a businessman and the church was completed very quickly. He offered small items of the interior to the parishioners to purchase in memory of families and others. This offer was eagerly accepted. I don’t know what others bought but I can say definitely what the evacuated schools chose. There were three large windows listed for £7 each and the staffs of the three London schools each bought a window and had their school badge and motto set in the window. 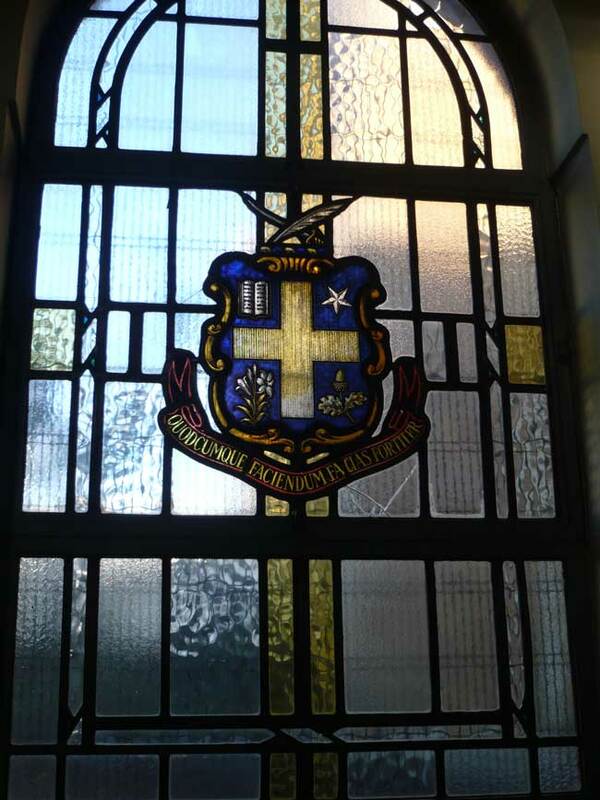 Our window, St. Dominic’s window, is the first on the right as you enter the church by the side door and it shows the Dominican badge and the word ‘Veritas’, the Dominican motto. 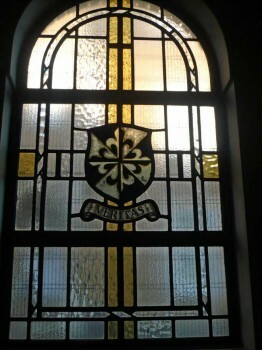 The next window shows the badge and motto of the convent school from Hampstead. 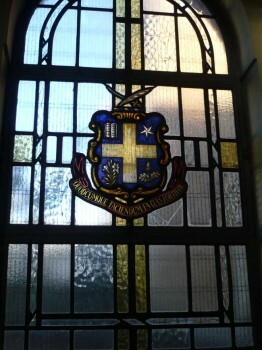 The third window, the one nearest the Lady Chapel, has the badge and motto of St. Aloysius Convent Grammar School in the glass. Fr. 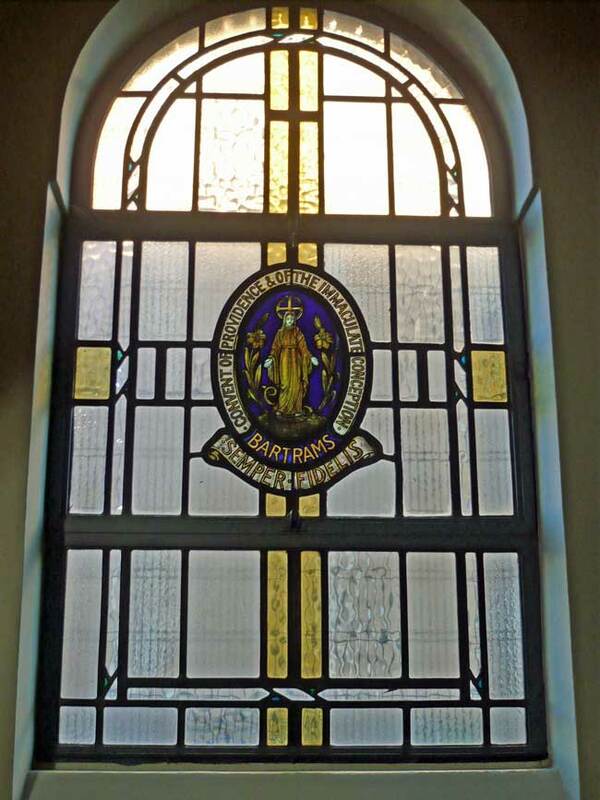 Koenig has since had a plaque made to commemorate our war years in the parish and it is fixed below the St. Aloysius School window. Mr and Mrs Monaghan bought a smaller window somewhere near the Lady Chapel, but I cannot remember now exactly where, it cost about £4. Of the smaller windows in the roof of the church, they were 3 pound 10 shillings each. Miss Beard bought one in the name of her mother and her sisters. Miss Geoghan also bought one of these windows. She chose one of Our Lady in memory of her parents. I think that Mr and Mrs Langley donated the sanctuary lamp. There were no side aisles in the church in the war days, the building was adequate for the size of the existing population. We could see over the years that the congregation has grown considerably since those days. I don’t recall much about the services in the old church. I recall our 9.15 Mass and 3 o’clock Benediction but otherwise I don’t remember them very well. However my memories of the new church are very clear. There was Mass every morning at 7 o’clock, it was fairly well attended. Mrs Monaghan was always present, so was Mrs Tailby with the two little St. Dominic’s boys, Freddie and Harry who were billeted with the family in The Grove. Mrs Loasby the school nurse was also at the 7 o’clock Mass each morning. I must mention Nurse Loasby; she was very good to our children. Apart from routine visits to the school we could consult her at any time with minor medical problems. The children were very fond of her. Throughout the year there were Devotions and Benediction, each Wednesday and Friday at 8.00pm. During May there were devotions and Benediction every evening Monday to Saturday at 8 o’clock. During June there were devotions to the Sacred Heart and Benediction every evening Monday to Saturday at 8 o’clock. In October there was rosary and Benediction every evening at 8 o’clock. During the whole of Lent there were Stations of the Cross and Benediction every weekday evening. Fr. Jones usually took the weekday services, although I recall Fr. Hunting taking some of the services during Lent. Mr Cunningham played the organ during the week. 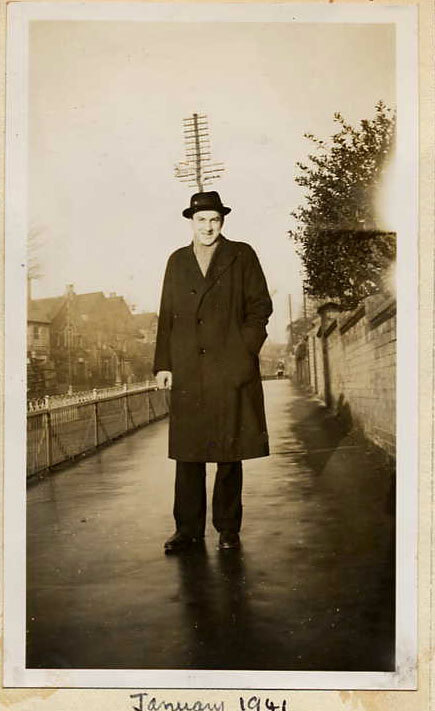 He was an air raid warden and if the sirens sounded during a weekday service he had to leave at once and go on duty. So I would go up to the organ loft and he would slip off one end of the organ seat still playing while I got into position and took over always hoping that I could finish what he had started playing. After he was called up I regularly played for all the evening services on weekdays while I remained in Kettering. In 1942 (it might have been 1941) Fr. Jones damaged his right hand, he cut it on glass I believe, and the injury was serious. His hand was in bandages for quite a time. He remarked to me one day that it was difficult to keep the bandages clean and he was concerned about saying Mass and giving communion with a hand in grubby bandages. Amongst our needlework stock, which we brought down from London, we had three or 4 ounces of good quality black wool and the children thought we should use it to make a pair of mitts for Fr. Jones to wear over his bandages and so keep them clean. So we bought a pattern of men’s mitts and the correct size needles. One of the little girls, she was about 10 ½, was an expert knitter; she could follow a pattern, so she supervised the knitting of a pair of mitts. Every child did a bit towards the knitting. Those who couldn’t knit, including the boys, were shown how to by the girls, did a few rows, or even just a few stitches. They all wanted to be part of the knitting. The little girl who had kept a watchful eye on the making of the mitts finally finished off the seams. A note was written to Fr. Jones and put in with the mitts and a little parcel was made up. Two of them took the parcel along to the Presbytery on their way home from school. Fr. Jones did use them so the children were very pleased to have done something useful. The 11.00 Mass on holydays of obligation was always packed. Apart from the St. Dominic’s children and the girls from St. Aloysius Grammar School, two other London Catholic schools came to the Mass. One was St. Aloysius Senior Boys School from North-West London. The pupils from this school were billeted in a village in the Rothwell direction and they would walk in for Mass, with their headmaster, Mr Carroll, and some of the staff. The other school was also a senior boys school from North London; they too walked in for Mass from a village outside the town. They were accompanied by their headmaster, but I can’t remember his name now. Fr. Jones said the Mass. The hymn singing was great. The three holydays of obligation, Ascension day, the feast of Corpus Christi and the feast of St. Peter and Paul always seemed to be on very hot sunny days during the war, and the centre doors of the church would be kept wide open during Mass to allow in fresh air. I was told that people would stand at the top of St. Mary’s road and listen to the singing. The final hymn on the feast of St. Peter and Paul was, of course, “God bless the Pope”, we didn’t use the usual tune in the Westminster Hymnal, but used the old tune which is in the Crown of Jesus hymnbook. With the extra number of boys in the church our rendering of this hymn was quite impressive. It lends itself to a large congregation and we did it justice. 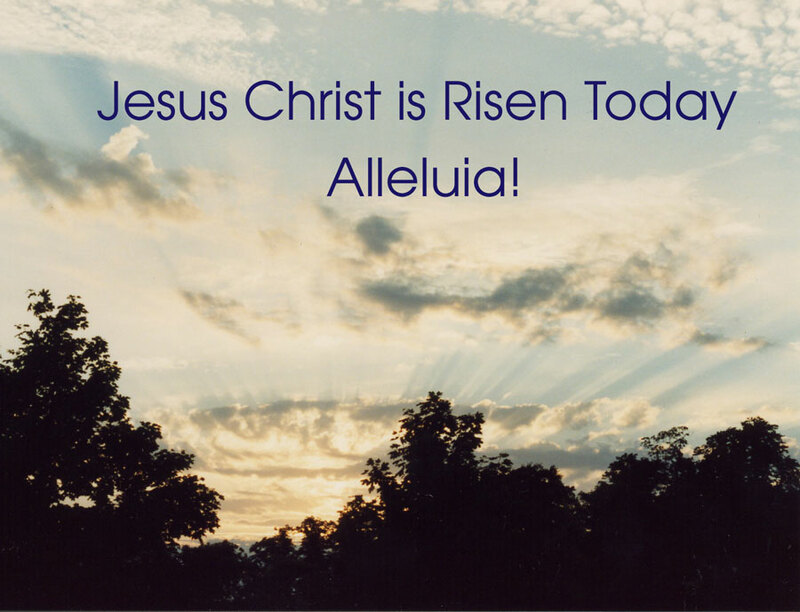 Now about Catholic Sunday as it was called by the towns people. I recall it was Corpus Christi Sunday and in those days, weather permitting, every parish would have an outdoor procession if possible in honour of the Blessed Sacrament. Kettering had a Blessed Sacrament procession. My billetor would say to me on the Saturday, “let’s get the dinner over quickly tomorrow, what are you going to wear?” The procession was quite an event, traffic was stopped, pavements were packed with the townspeople and the sun shone. The parishioners walked, St. Aloysius girls walked, wearing their uniform summer dresses and white veils, I think they wore veils, our children walked wearing what they usually wear on Sundays, we made veils for the little girls from any net that we could get, the two other Catholic boys schools walked in from the villages and joined us and we lined up in The Grove and waited while the “O Salutaris” was sung in the church, in the new church of course, as the Blessed Sacrament was taken from the tabernacle and placed in the monstrance. Dominican priests from Laxton came for the procession and one of them usually carried the monstrance with another Dominican priest on either side of him beneath the canopy. 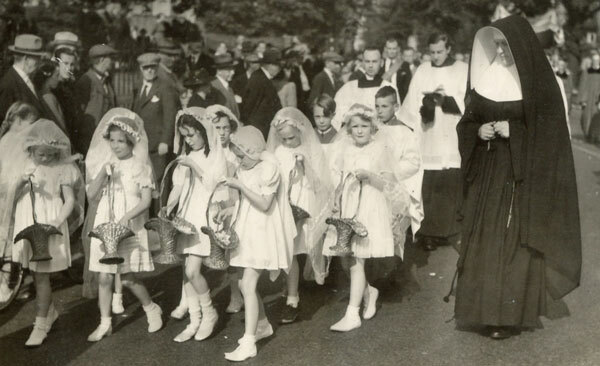 One of the sisters from the convent in the Headlands had trained about 12 little girls to strew petals before the Blessed Sacrament during the procession. The procession started from The Grove and turned into London Road, past the priests waiting in front of the church, and into Bowling Green Road. As we walked in formation we sang hymns and I don’t doubt were led by a band. We walked in fours, maybe in two’s, on either side of the road. The centre of the road was kept free. Fr. Hunting was in evidence, making sure that everything went according to plan. The procession slowly turned into the Headlands, along to the convent, where we had Benediction in the grounds. After Benediction I think we must have returned in formation back to the church, but my memory fades after that Benediction. Quite an afternoon, something to remember always. There must be parishioners still in the town who remember those Corpus Christi processions, longer in the war years with two Catholic schools in the town and two more Catholic schools who came in from the villages. Fr. Hunting (1946) There was High Mass at 11 o’clock (I think it was 11 o’clock), every Sunday and Devotions and Benediction every Sunday evening at 6 o’clock. 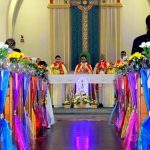 The evening Benediction on the third Sunday of the month was the monthly service for members of the Guild of Our Lady of Ransom and the church was always full. The organist for Mass and Benediction on Sundays was a lady by name of Marie Clare, I didn’t know her surname, she was a teacher on the staff of the convent school in the Headlands and was a very good organist. The Ransomer’s service closed with their hymn, the tune for this hymn I’ve always known but never heard it used anywhere else before or since. It is in one of the Notre Dame hymn books. It would be called a rousing tune, and the congregation on that summer Sunday did justice to it, they almost raised the roof. Fr. Hunting liked music and in Holy Week during the war he had the full ceremonies, and by full I mean full! The Americans were stationed at Grafton Underwood and two of their chaplains, Fr. 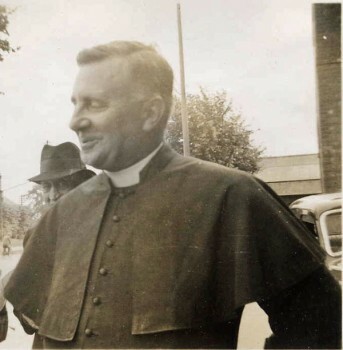 Poletti, a member of the Passionist order and another priest who was a Redemptorist Father [Fr. Meighan C.S.S.R], were available to assist with the ceremonies. So was Fr. Gerard Scriven, a White Father who was resident in the convent in the Headlands for a year or two. He was a missionary priest and quite picturesque in his white habit and red fez. Fr. Lescher, when in Kettering, was also available for Holy Week. So with 6 priests, sometimes 7, Fr. Hunting could have all the Holy Week ceremonies. Remembering Fr. Gerard Scriven, he died at the early age of 37, shortly after the war ended. He wrote one or two books for children. The Wopsy Books come to mind about a little African boy and his guardian angel. Each year, at the end of the Christmas term, St. Dominic’s children sang carols around the town on 3 evenings after school. We collected for the fund for prisoners of war. It was very dark after school in December, there was very little street lighting. Two or three children had torches with the glass end half blacked out and they all enjoyed being out in the dark and singing carols. One evening we sang carols in the wards of St. Mary’s hospital in London Road. We didn’t collect that evening but gave pleasure to the elderly patients. Matron wrote to the children afterwards to thank them for coming. It was good that they knew that they had given pleasure. In 1941, Angela Scriven, one of Fr. Gerard Scriven’s 6 sisters, arrived in the town. She was a competent and keen Guide Captain and she started a Guide Company. They held their meetings in the parish hall. After about 9 months she returned to London. I was sorry to see her go. Monica Scriven, her sister, was at school with me at Notre Dame Southwark, many, many years before and it was nice to meet another of the family. The Guide company continued to flourish with Agnes Langley who took over as Captain when Angela left. With a Guide company, Brownies were needed next, also cubs. 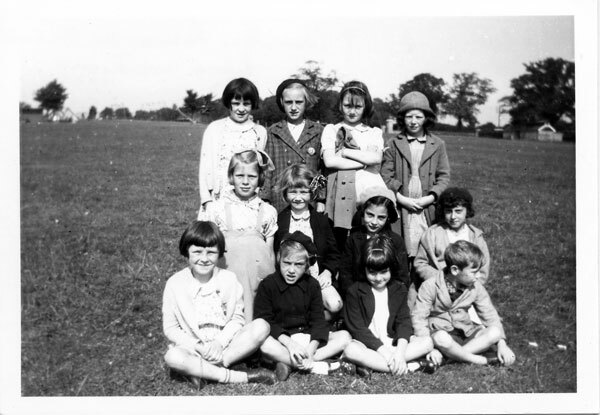 I do not recall a scout troop, but Mrs Langley started a cub pack and Mrs Monaghan was asked to start a brownie pack. She did take them twice, but she had so much work already, with the responsibility of our children away from home and needing their proper education that I offered to take the brownies. They were very keen little girls, mostly parish children. After I returned to London I heard that the pack had closed, this was a pity, those children enjoyed brownies. 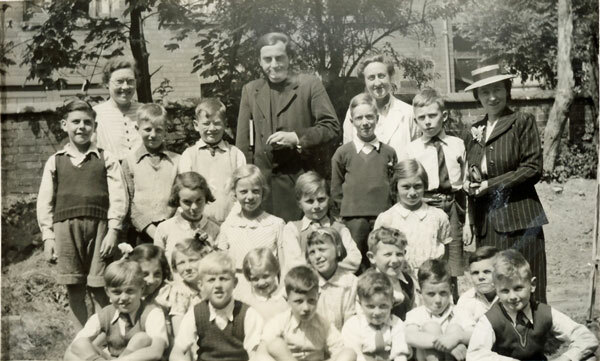 In 1943 St. Dominic’s school officially returned to London. Mrs Langley threw a party. Mrs Monaghan returned from London for the celebration. L-R. Back Row: Maureen Brass, Fr. Kevin Jones, Miss Sheelah Hynes, Mrs Monaghan. Standing: Christopher O’Flynn, Henry Fitch, Tommy Bradford, Jack Dixey, Anthony Barnett. Kneeling: Brenda Philips, Doris Fitch, Michael Hanlon, Doris Watts. Sitting: Michelina Allocca, Blanche Winter, Gladys Bartley, Betty Enniver, Brian Parker, Cornelius O’Flynn. Front Row: ?, Kevin Carroll, ?, Leo Bartley, ?, Jimmy Bartley. In June 1943 I made it known that I was being recalled to London. I was having tea one afternoon in July, with Mr and Mrs Langley and Agnes and Fr. Poletti came in and joined us for tea. We were talking about the final days of St. Dominic’s in the town. 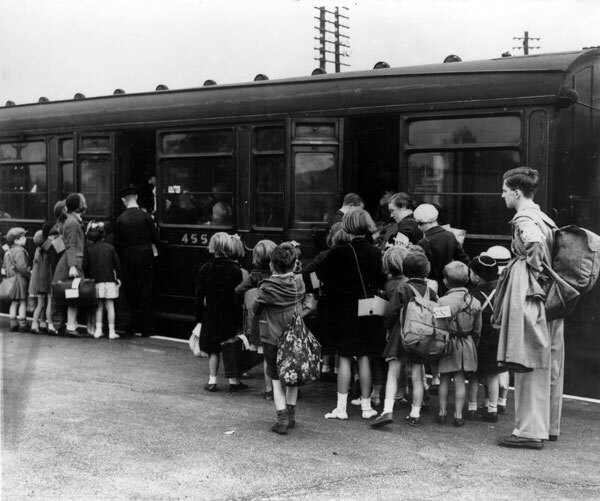 Some of the children were going back to London, two or three whose parents could afford the fees and the uniform were going to St. Aloysius Junior section in Rockingham Road. One or two 11 year old boys were going to the Kettering Boys School and it left 2 very quiet little 11 year old girls to go to the Kettering Senior Girls School. I mentioned this while we were having tea and said that I was worried about the two little girls soon having to cope in a large senior girls school after being used to a small mixed group. The next day Fr. Polletti contacted me with sufficient money to pay St. Aloysius Junior fees for the two little girls and fit them out in full uniform for the rest of their time in Kettering. The money was given to Miss Hynes to be used for their fees and uniforms as she was remaining with our children until the end of the war. Fr. Polletti had returned to camp after tea that day and had a whip-round amongst the troops for money so that the two little girls about whom I was worried could go to the Convent Junior School. Such thoughtfulness, such kindness. I left Kettering with an easier mind. Fr. Polleti and the American troops will always be remembered. There are other little incidents that I can remember but I think that this is enough to give you the history of St. Dominic’s in Kettering in the Parish of St. Edward’s Catholic Church in London Road. As an afterthought I am adding a few more words of more recent evacuation history. After I retired in 1980 I decided to tour the villages of Northamptonshire. We used to cycle everywhere during the war but in 1981 I decided to drive around the county. Two friends who were not evacuees were coming with me and Agnes Langley invited us to stay with her in 113 Greenhill Road. So started a week each year with Agnes. Sometimes she drove, sometimes I drove, we toured the county, plus a day every year at Mount St. Bernard. We so enjoyed those weeks with Agnes. I noticed on one of our visits that the three windows given to the church in 1940 by the staff’s of the three London evacuated schools had been damaged and I didn’t want our wartime history in the parish to be lost if this damage were to go on. Little boys must play football and that space beside the church is very inviting, it is no use worrying if their footballs crack our windows, the answer is to get the windows protected. So in 2000 I wrote to the Provincials of the FCJs and of the Sisters of Providence and suggested that we protected the windows from further damage. They were very keen to have the windows protected so I wrote to Fr. Koenig and asked him if I might get our windows protected at no cost to the parish. He readily agreed but said that whatever protection were fitted it must allow for the windows to be opened fully in hot weather. To find a firm who would fit cages (as we called the protective grids) in a way that would allow the windows to open fully delayed the work. I contacted a number of firms around the counties who could fit window protection to stained glass windows but their methods would not have allowed the windows to be opened. It was all very interesting, and I learned a good deal. Finally I found a firm in Buckinghamshire (I think it was in Buckinghamshire) who could do the work as I suggested and as Fr. Koenig wished, and the work was carried out in June and July 2001. 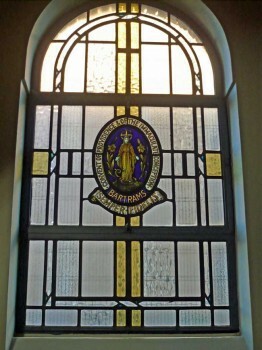 The two religious orders, the FCJs and the Sisters of Providence were very pleased that their windows in the church were now protected from footballs and other missiles. The cost of the work was £210, which we shared between us. Sister Catherine the Provincial of the Sisters of Providence in Hampstead wrote to thank me for getting the work done and enclosed a cheque for £70, their third of the cost. Sister Carmel Hanley, bursar to the Provincial of the FCJs in their Provincialate in Manchester wrote thanking me for getting their bit of wartime history in the church saved for years to come and enclosed a cheque for £140. She said that the Provincial wished to pay for St. Dominic’s window as well as for their window. This was so very good of them and I wrote to thank them. The bill was paid in July 2001. I later made enquiries about the cost of repairing the damage already in the windows. I know a London teacher who teaches the art of stained glass to students. After discussing this kind of repair work with her I know what a very big job and what a very costly job any repairs would be, so unless I win the lottery or get one of the millions in a premium bond draw, I will forget about having the damage in our windows repaired. Perhaps a word is needed here to explain why the Provincial of the FCJs in Manchester was consulted and not the superior of the convent in North West London. Somewhere along the years St. Aloysius Grammar School, although in the same building in North West London, has amalgamated with another convent school and become a comprehensive girls school. The name is now Maria Fidelis Comprehensive School. I regret that I haven’t been back to Kettering for several years, but I hope that all is well with our windows.